Think of the Hyundai Sonata and most Singaporeans would immediately associate it with a ComfortDelGro cab, which isn't the most glamorous of ways to be remembered. So when we decided to pit the latest Sonata against the Passat, a model that brought Volkswagen a step closer to brands like Audi, BMW and Mercedes, we asked ourselves, "Are we completely off our meds?" There are two reasons for doing so. One, the Passat during one of Volkswagen's weekend promos was almost the same price as the Sonata, and two, having previously already reviewed the Sonata, it's not as second-rate as you'd expect. The first impression of the cars, when parked side by side, is that the Sonata is obviously the bigger car here. 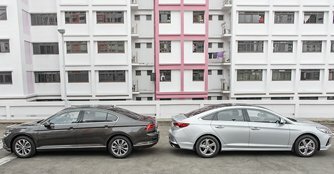 It is longer, wider and taller than the Passat, although the latter is the more visually appealing one, with its sharper sheet metal architecture and more lavish use of chrome trims. 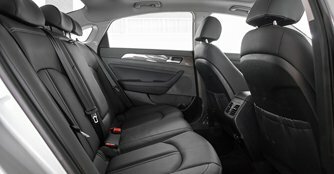 On the inside, the Sonata offers slightly more leg, shoulder and headroom all around compared to the Passat, as well as an overall cushier, cosier cabin. 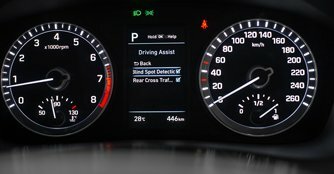 It's also richer in features, having stuff like wireless charging, ventilated seats and blind spot detection as standard. The Passat, however, does have a larger 586-litre boot that's a whole 76 litres more than in the Sonata. 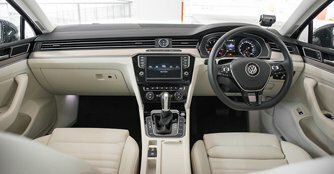 At the same time, the materials employed within the Passat's cabin are of superior quality and finish. That's not to say the Sonata isn't well built because it's anything but. Unfortunately the use of tackier plastics and a surprisingly outdated infotainment system is its Achilles' heel. The fidelity of the system, too, pales in comparison to the Passat's. Past the Sonata's lesser presentation is a car that's highly refined and outstandingly accomplished. At idle, there's barely a whisper from its engine. While on the go, it's also just as, if not slightly quieter, than the Passat as long as you're not revving it hard. More impressively, it's also able to soak up the road's imperfections a little more smoothly than the Passat, which rides a little firmer. This grace from the Sonata, alone, is a triumph for Hyundai. But if you're one who likes a bit of spirited driving, the Passat is the one to have. For one, it's more powerful, with 178bhp and 250Nm of torque from a turbocharged 1.8-litre. Thanks to that, it feels lighter on its feet and will smash the century sprint in just 7.9 seconds while the Sonata will take 11.1 seconds. And around twisties, the Passat's eagerness and ability to dance from corner to corner also makes it the livelier one. Power aside, the Passat's turbocharging also translates into better fuel economy. It manages 10.3km/L with a reasonable right foot whereas the Sonata averaged 9km/L. In the past, it would almost be impossible to beat the package that is the Passat and we'd say it still is, given the car's precious few faults. Personally, we would still pick the Passat because we prefer turbocharged cars and we are extremely picky when it comes to a car's cabin's fit and finish. But professionally, we'd say the Sonata has been the more memorable car. It may not be as fast or fashionable as the Passat but close your eyes, go for a ride and it's hard to tell you're in a Hyundai. For buyers who aren't fussy about brand, the Sonata does fulfil most whims and fancies. It certainly won't be able to overtake the Passat's sales just yet, but give it a couple more years, and we won't be surprised if it does.